Nothing is more important in every studio than a good pair of monitors. If you’ve never heard music through a pair of decent monitors, you might be blown away by the detail they can provide. The cheap monitors are usually the piece of crap. The good studio monitors typically cost > $1000. And what are the stand for “good” monitors, anyway? Often what sounds good to one person, can sounds dreadful to another. If you are the beginner, you would be crazy to pay all that freaky money for unsure results. Solution? Research. There is always plenty of fish in the sea. We have to spot the one, that is most popular. 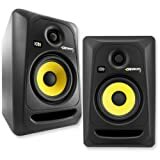 That’s why I made a list of the most affordable studio monitors for home studios sorted by the overwhelming flood of positive reviews for each of them. What sometimes takes your attention on the pictures of other bedroom recording studios, is the distinct yellow color of some monitors in the background. Big music producers, like Dr. Dre have lot of pictures on the internet with monitors looking familiar. KRK is a very solid brand. KRK Rockit 5 are the most popular, reviewed and highly recommended monitors for all small home studios. At that price level, you will not find the better deal. Low price, the numbers of positive reviews….seems pretty much similar to KRK’s. If you are buying your first pair of studio monitors, but you don’t like the yellow color, you won’t be sorry, after getting JBL. JBL designed this monitors with many “borrowed” hi end features that can be found in their flagship unit the M2 Master Monitor, priced at a crazy $6.000 a pair. Here we go! AWS.InvalidParameterValue: B00HNKLN2Y is not a valid value for ItemId. Please change this value and retry your request. Maybe you won’t find there “near perfect” reviews of the previous mentioned monitors. But it doesn’t mean, that I put M-Audio AV40 here by mistake. Especially, if you consider one BIG advantage over the others. This monitor costs HALF as much. Right. I repeat again. They are priced / 2. Rare exception. Normally for that price you will find only garbage. 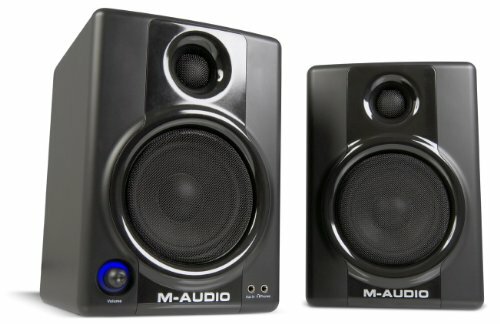 If you are on the budget, your first studio monitors don’t need to be the killing one. Also, it takes time to learn how to listen your mixes properly, how to hear details and clarity in the music. I guarantee, that for that price, you WILL NOT find the better deal. Also remember, regardless of what you get, you should also buy a pair of isolation pads so the quality of sound aren’t negatively affected by the surface you place them on.